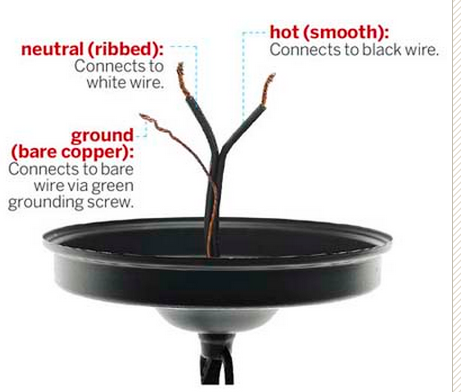 The Good Things: basic electrical work, refurbishing items, and adding charm to our kitchen. Part of me dies a bit when I paint over wood. But Painting over Brass? Welll…. not so much. 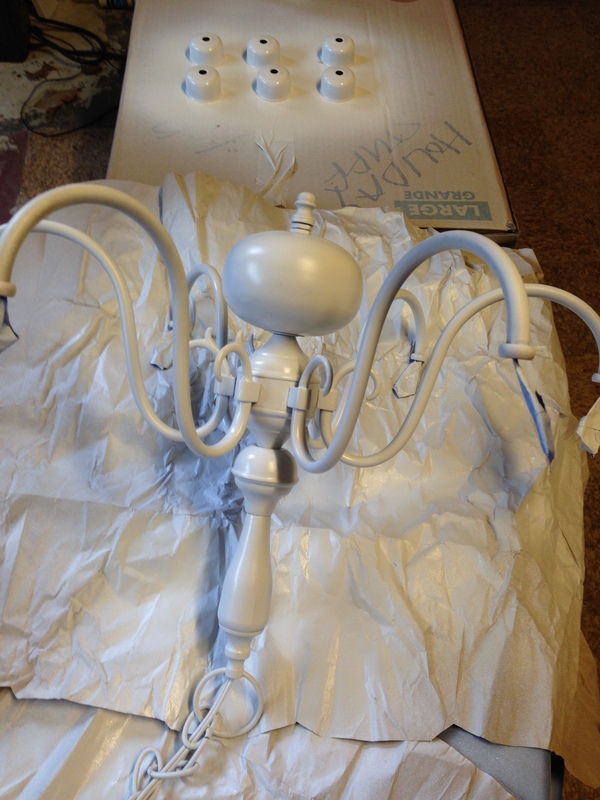 Though I’m no stranger to ‘upgrading’ light fixtures. 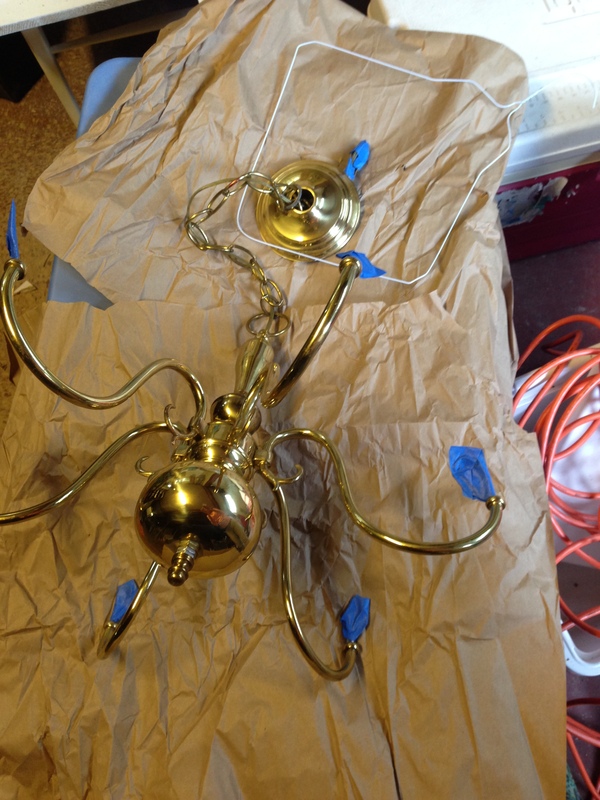 I’m pretty obsessed with the new DIY trend of painting brass light fixtures. 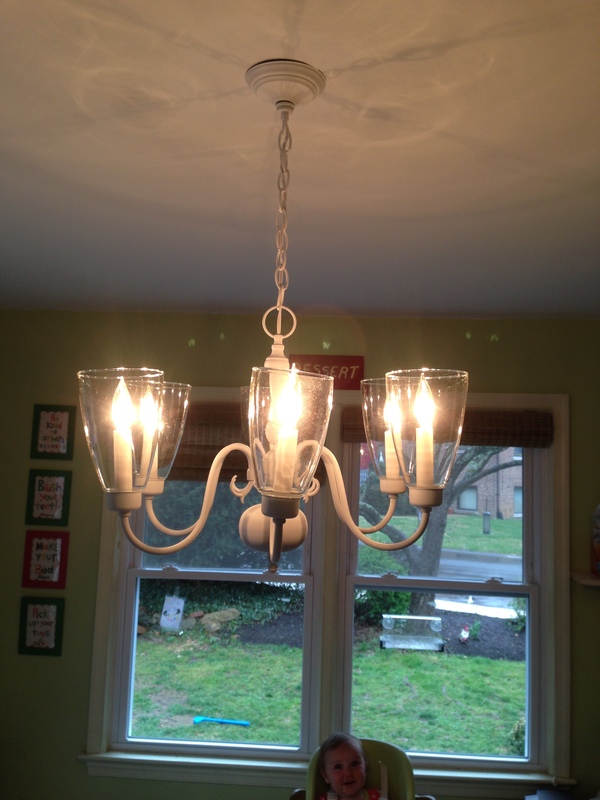 So when I found a FREE chandelier looking for a good home, I quickly scooped it up. 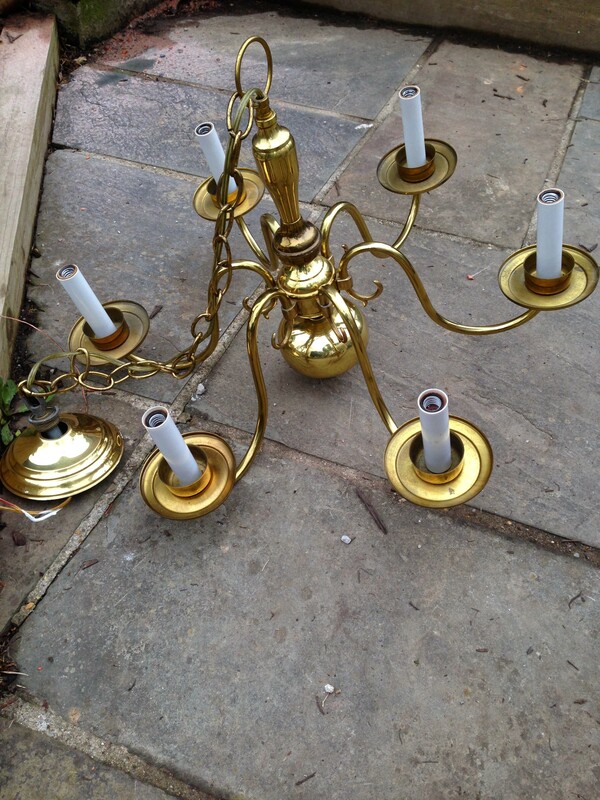 The original plan was to remove the candle type holders and replace with shorter lightbulb holders for a more modern look. Local Hardware stores carry them in various sizes for about $12 for a pack of 2 ( 3 packs x $12 $36) On this particular day, my local hardware store only had two packs of 2-inch holders. The combination of impatience, having about 10 minutes of time before preschool pick up, and the general dislike of spending money… I decided to forgo the lower light holders and hope for the best. 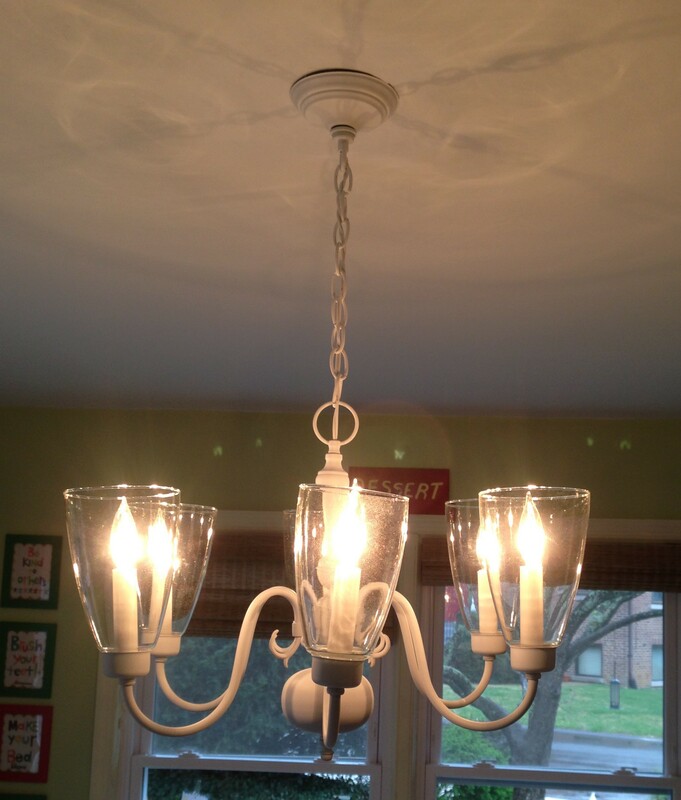 So before all of that, you need to have a rehabbed glamorous light. 1/ clean off the light and *lightly* sand away any rust/dirt/etc. 4/ With any kind of metal painting you want to PRIME. Trust me, it will never dry right and it will make a mess if you don’t. p.s. I was so happy with the flat white look, I actually decided to just use the primer! When it is COMPLETELY dry figure out the length that you want or need and cut the chain (or in my case woman-handle it with any tool you can find) until it’s the appropriate length. 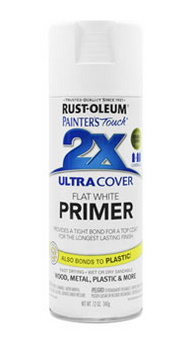 5/ Once installed look for any blemishes/unpainted areas. If you see any grab a piece of cardboard hold up behind and spray. Not bad for a $4 light! Off with you! Go give an old light another chance!